MDC leader Nelson Chamisa has reiterated his commitment to dialoguing with President Emmerson Mnangagwa with hopes to end a deepening national crisis but says talks remained a fallacy if his MPs continued being hounded out of their homes by security agents. 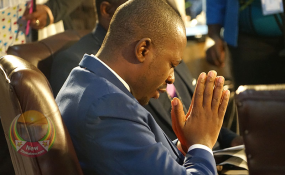 He was speaking in Harare Thursday at a national prayer breakfast meeting organised by local church groups led by the Zimbabwe Council of Churches. Chamisa wore his heart on his sleeve, saying he would not shy away from talks with his Zanu PF rival if only it could be acknowledged that the current national impasse stemmed from a disputed July 30, 2018 poll. The opposition leader said his input into the national discourse could not be wished away as he represented great sentiment within the national populace. "When I come here, I do not represent myself Nelson Chamisa, the 41-year-old. I am carrying two point six million voices behind me and those voices must be heard and respected," he said. Chamisa added, "As I come to you, I am representing members of parliament who cannot even sleep in their homes on account of politics and accusations." Calls for a national dialogue reached a crescendo this past month when fierce rioting erupted among citizens who were angered by a government increase in fuel prices. Government responded by unleashing the country's security forces to hunt down alleged perpetrators of looting, property destruction and the disruption of the normal day-to-day lives of locals. Over a thousand were arrested and dragged to court with the majority still languishing in remand prison countrywide. At least 12 civilians died through gunshot wounds by security forces while dozens were treated for various degrees of injury inflicted through gunfire. Several MDC MPs are reportedly in hiding after it has emerged the state was keen to question them for allegedly masterminding the protests. Said the MDC leader, "We cannot have dialogue when other people are in prison and others are wailing on account of politics; no dialogue when other people are mourning and wailing for their loved ones on account of deaths that have visited them. "I am coming here on behalf of a people who have been brutalised, a people assaulted, not having committed any crime and just having freedom of conscience and supporting MDC." Chamisa also raised concerns over the continued deployment of the army to harass civilians at a time President Mnangagwa was calling for dialogue. "We want our army where it belongs, not in the streets and not in our homes. "We are ready to have dialogue any minute once that is done. We are ready to move on but, first things first. We are hiding the answer and because we do not want to confront the truth, that is why we are not moving. "Let us seek the correct path through turning to God. We need to repent first and do away with our wickedness," said the opposition leader." Mnangagwa did not attend the event but sent Defence Minister Oppah Muchingiri-Kashiri, who is also Zanu PF national chairperson. The President Wednesday met political leaders who took part in the July 30 presidential elections for the launch of the dialogue process. Chamisa did not attend the Wednesday event.